Justinmind Enterprise is integrated with Microsoft Team Foundation Server (TFS), also known as Visual Studio Team Services or Azure DevOps Services, and you can import and export your work items to and from Justinmind. Open Justinmind and go to the Requirements module. 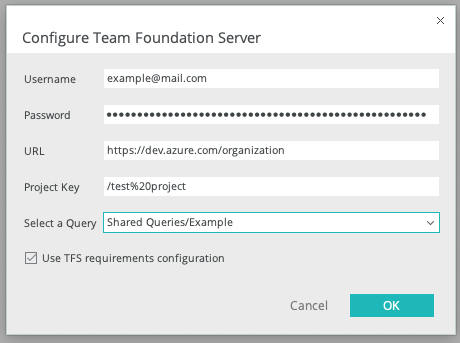 To configure TFS, go to the “Plug-ins” main menu option and select “Team Foundation Server”. Then, select ‘Configuration’. 5. Query: leave the field blank to begin with and click OK. 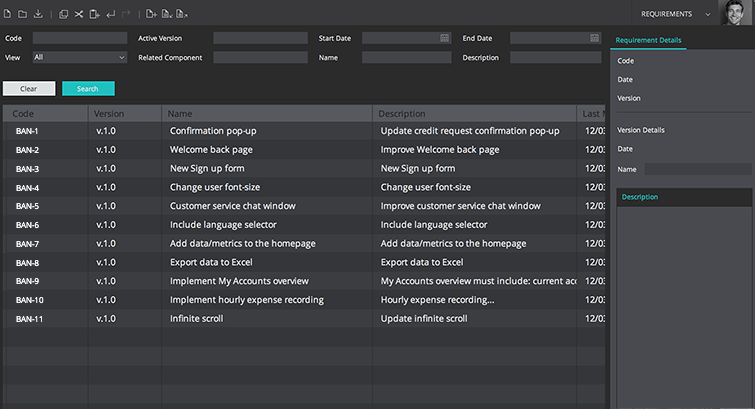 Reopen the dialog and select/filter your queries. 6. If you want your requirements to take on the TFS column settings, tick the “Use TFS requirements configuration” option. Untick this option if you want to use Justinmind’s column settings. 1. Query has to be at root level, i.e. Shared\Query. If stored at Shared\Folder\Query, you won’t get any results. 2. Query must be set to return results in a flat list. It won’t display results as a tree. 3. Any work item in query results will be imported as a “Requirement” – that includes bugs, tasks, and custom work item types. Users must do any filtering out in query. To import your TFS work items, go to the “Plug-ins” main menu option, and under “Team Foundation Server”, select “Import Requirements”. A dialog will appear letting you know that the work items are being imported from TFS, and when the process has been completed. Click “OK”. 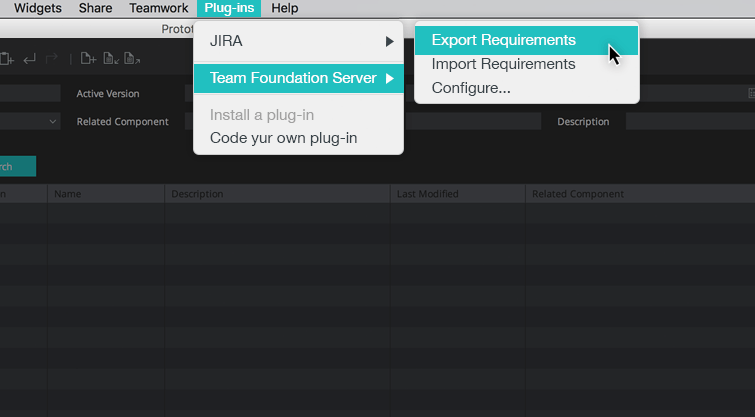 If importing has been successful, you’ll see your TFS work items appear in the Requirements module. Once you have successfully imported your work items, you can start to use TFS to define scenarios, screens and events within your prototype. To do so, go to the User Interface module. Then, simply drag Justinmind requirements (TFS work items in Justinmind) from the Requirements palette at the bottom of the editor to the canvas, and drop them on top of scenarios or UI elements. 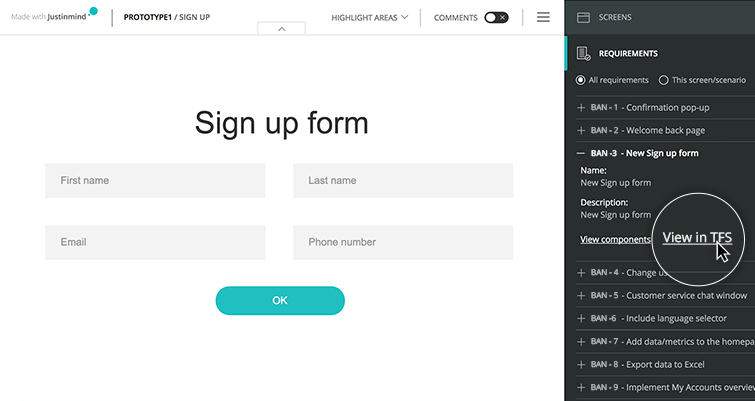 Read more on adding requirements to your UI elements here. Click “OK” to proceed or “Cancel” to return to the canvas. From the canvas in the User Interface module, click “Simulate” to view your prototype. On the right, you’ll find a hamburger menu. Click it to see the Requirements panel (below to the Screens panel). 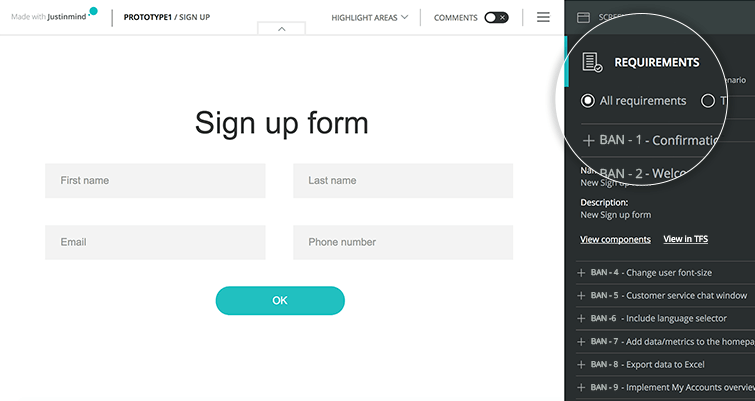 Click on the linked requirement and you’ll find an option to “View component” on the left. Click to see the linked element highlighted in green. In the Simulation window, click on a linked requirement. Select “View in TFS”. You will be taken to the associated work item within TFS. 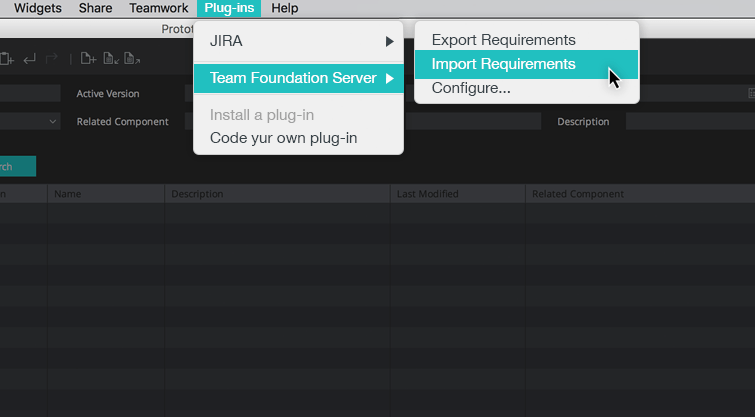 Back in the Requirements module, go to the “Plug-ins” main menu option and select “Team Foundation Server”. Then select “Export Requirements”. 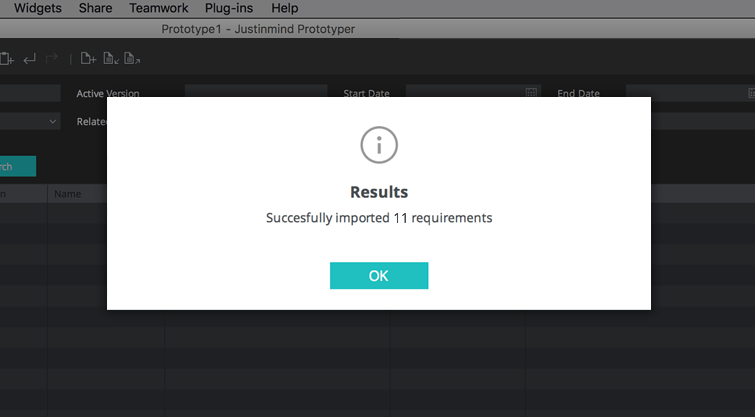 A dialog will appear letting you know that the requirements are being exported to TFS. Click “OK”. Back in the Requirements module, click on the Integration tool URL of any requirement in the Requirements module to view the corresponding Justinmind requirement in TFS. 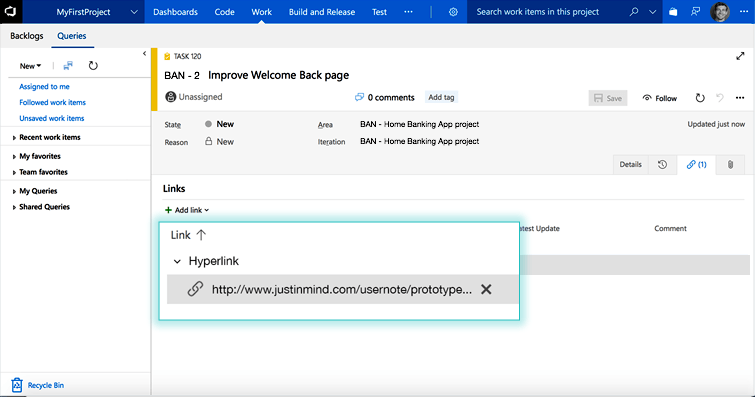 Once in TFS, click on the hyperlink icon in the “Links” section for a direct link to the Justinmind prototype related to this TFS work item. You will be taken to Justinmind’s simulation window.